Half helmets often seem to fall into one of two categories. They are either super bulky, uncomfortable, and catch wind like a sail… or they are so streamlined and sleek that they are lacking in functionality (or DOT certification!). When you find a helmet that has been built to offer value in both realms, that is something of which to take note. With the new HJC CL-Ironroad Helmet, designers were aiming to combine both aesthetics and utility into a slick looking half-helmet. 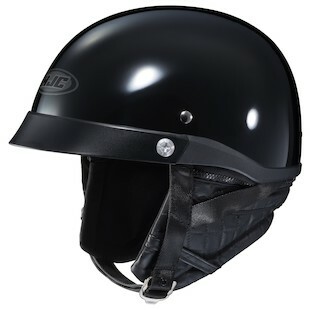 Designed using advanced CAD technology to optimize fitment inside an aggressively styled polycarb shell, riders can make use of features such as an aerodynamic low-profile visor and removable ear pockets that are ready to accept speakers from a communication unit. Additionally, to get the most secure fitment possible, HJC has included a dial comfort adjustment mechanism that allows riders to better pinpoint their own unique settings. Constructed with the cruiser crowd in mind, the new HJC CL-Ironclad Helmet is a great choice for motorcyclists looking for an upgraded half-helmet experience.